To commemorate the 50th anniversary of the National Environmental Policy Act, and to provide a historical lens on several high-profile water projects currently underway, Water Education Colorado together with Colorado Trout Unlimited and the One World One Water Center of MSU Denver are pleased to offer a half-day educational event. The event will tell the story of the EPA’s 1990 veto of one of the largest water projects in Colorado history, and how the Denver metro area has moved forward in the aftermath of the project’s demise. Following a continental breakfast, the agenda will feature two panel discussions, focusing first on the events leading up to the veto of Two Forks, and then following up with an exploration of what has transpired in the years since that have laid the groundwork for Denver and the surrounding suburbs' evolving approach to providing water to growing communities in an era of increasing water scarcity. 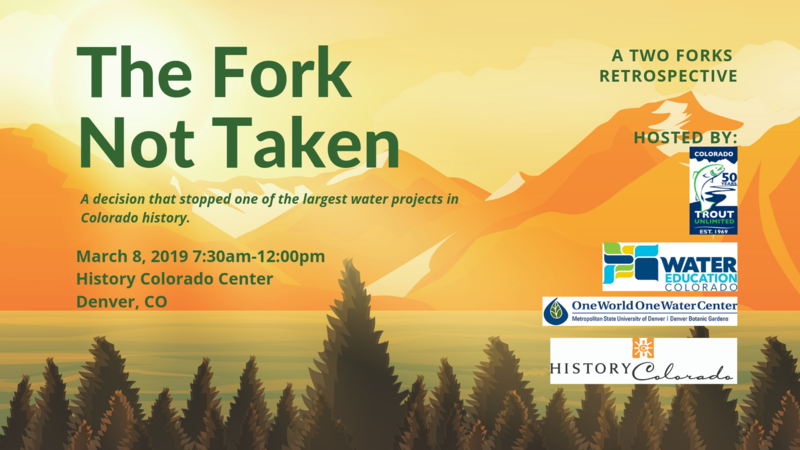 This is an event any Coloradan who cares about water should attend! Discounted pricing and a limited number of scholarships are available for students. Students interested in obtaining a scholarship should contact Nona Shipman at the One World One Water Center at nshipman@msudenver.edu. Discounts are also available for members of Water Education Colorado, Colorado Trout Unlimited, and the History Colorado Center. Read more in the draft agenda, and don't wait to register. Seats will go quickly! Registration closes on Thursday, March 7 at 4 pm. Sponsorship opportunities are still available. Learn more here.